Is it the Tower of Destruction or the House of God? In card number sixteen of the Major Arcana, we are met with yet another image that often inspires fear and superstition. 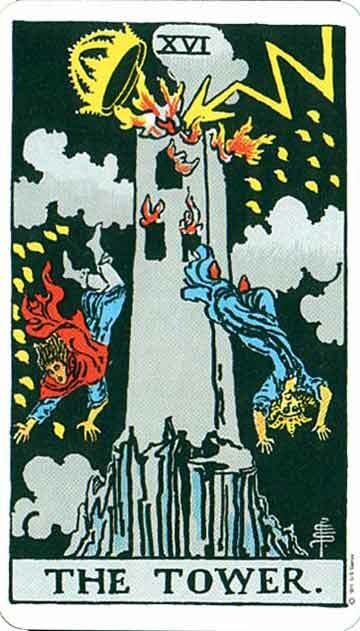 This is the first podcast in which Julienne Givot and Cyndera Quackenbush are divorced from their own tower (the recording studio) and explore this card’s symbolism from the telephone. With the sudden shock experienced in this stage of the fool’s journey, will those tethered to their addictions be struck from their habits? Does hitting rock bottom ultimately free us? Cyndera explores how a client once completely dissembled her own psychic castle and Julienne reveals the qualities of the Liberator archetype. A closer look at current events and films such as the Hunger Games, Castaway and Groundhog Day also helps us all to “think outside the tower.” Also, don’t miss this podcast’s first homework assignment to watch Beasts of the Southern Wild through the lens of the Archetypal Tarot Journey. 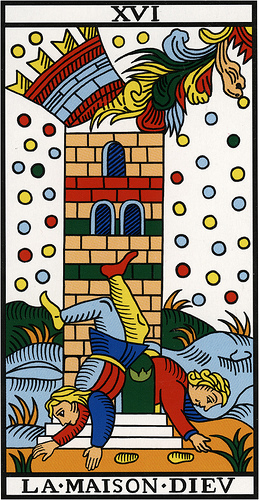 We’ll be discussing it in the next edition along with the 17th card of the major arcana: The Star. Cast Away (2000) Tom Hanks – A FedEx executive is transformed physically and emotionally after a crash landing on a deserted island. Religion/Myth: Milarepa – Buddhist Saint who had to rebuild a tower again and again as a part of his karma. do you remember the tibetan buddhist story you were referencing about building and knocking down the tower? Hi Lauren – Yes – it’s in the life story of Milarepa. I added a link to it in the post above.